Unless you hail from the Last Frontier State-- or follow the track and field goings-on in Alaska fairly closely-- there's a decent chance you haven't heard much about Service High senior Ben Jackson. While fellow Alaskans Trevor Dunbar and Jordan Clarke, both state all-timers in their events, have deservedly received a good deal of attention in the Lower 48 the last two years, Jackson has been less visible to the rest of the nation. That may not be the case much longer. 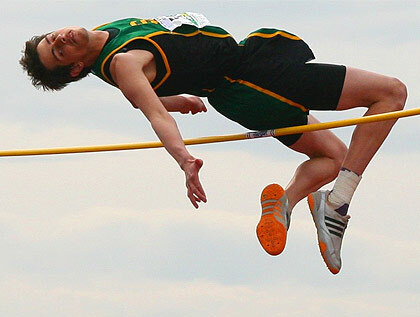 He's been the best jumper in Alaska the last two outdoor seasons-- sweeping the high jump, long jump and triple jump at the 2008 4A State Meet, and in March became the best prep high jumper ever from Alaska, with a PR of 6-10 achieved at the Mini A Meet in The Dome facility. 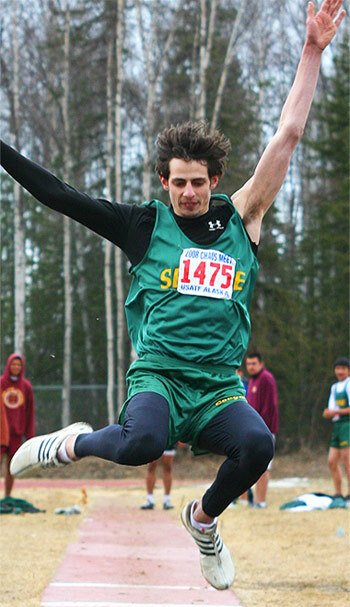 That jump surpasses the boys state record of 6-8 by East High's Dave Wilts in 1982, but because an Alaska state record can only be set at the state meet, Wilts' mark remains. Again, that may not be the case much longer. The BYU-bound Jackson has cleared 7-2 in practice and is eyeing a big effort the next two weekends as he prepares to defend his state titles. With bests of 44-08.50 and 21-03.50 in the triple- and long jump, respectively, Jackson also runs a leg on Service's 4x400 relay, and intends to contest all four events at Lathrop HS May 22nd and 23rd. DyeStat senior editor Dave Devine pays a visit to Anchorage for a quick catch up with the best jumper in Alaska. 1) You’ve been having a great start to your senior year, hitting the all-time Alaska best in the high jump and leading the state again in all three jumps. How has the season been going from your perspective? In the high jump I’ve been jumping at 6-4, and then skipping up to 6-8, then skipping to 7-feet. So, I only jumped 6-10 once. I’ve cleared 7-2 in practice, but haven’t been over 7-feet in a meet yet. I’m definitely looking for more soon though. 2) It seems like high jump is certainly going best for you right now, but success aside, is there one jump you prefer above the other two? Do you find any of them more enjoyable or rewarding for you as a competitor? How do you balance the three jumps in a given week of practice? High jump is going best, and I plan to do high and triple at BYU. High jump is my best though. I like the high jump most too, because I think it’s more fun than the other two. I high jump on Mondays, run on Tuesday, do long jump on Wednesday, then triple jump on Thursday, and rest for the meet on Friday. It’s pretty much one event each day throughout the week. We also do plyometrics and drills all the time—every single day. 3) With the Alaska State Meet just over a week away, are you getting excited to defend your three state titles from last spring? Can you talk about your motivation and drive to defend those championships, and what your prospects are looking like heading into the meet? It was pretty fun to get them, but I think it will be even harder to defend them this year, because there are a couple of kids who have come out of nowhere. I should still be able to do it, and then I’m hoping to go to USATF Junior Nationals in Oregon in the high jump, so I’m just hoping to jump as high as I can next weekend. 4) I know you’re a three-sport athlete, competing in football during the fall, basketball in winter and track and field during the spring. As good as you are in track, how do you find the time during the fall and the winter to balance your commitment to track with football and basketball? Do you train at all for the jumps during the other seasons, or just trust that the fitness from your other sports will carry you into the spring season? In Alaska we have a short track season, and once track is over we don’t practice anymore. So during basketball season that’s all that’s asked of me—basketball. The meets at the Dome were about two weeks after basketball season, and we were just getting started in track at that point. 5) Can you discuss this new facility in Anchorage, The Dome, a little bit? It’s a pretty unusual thing for most people in the Lower 48, to have a 400-meter indoor track. What is it like inside, and what has it meant for some of the athletes up in Alaska? In your particular events—the jumps—do you feel like that “outdoor environment,” achieved inside, helps or hinders your efforts? I think it’s actually like 413 meters, and it’s a big inflatable dome, filled with pressurized air. And yeah, it’s pretty much like being outside. In the jumps, I actually did worse inside the Dome. It just doesn’t feel the same for me to do something inside as it does outside. 6) How did you first get involved in track, and how did you find your way to the jumps? Is it something you’ve been doing since you were in middle school, or did you get into it once you reached high school? What was your initial immersion into the sport? I moved from Texas [to Alaska] going into seventh grade, and my basketball coach there saw me and said he thought I should do the high jump. So I tried it out, and I jumped 5-2 my first year and got second place at the City Champs. And then I jumped 5-9 the next year, in eighth grade, and beat everybody. My freshman year I went to the state meet for triple jump and high jump, and got fourth in the high jump. Jumping 6-3 that freshman year was the first time I thought I could do something long term in track and field. 7) Having moved to Alaska from Texas in seventh grade, did you find it hard to get recruited, and just recognized in general, competing in Alaska? Were there extra hurdles of distance, relative geographic isolation and lack of visibility that you had to overcome? How did you first come to the attention of BYU? Yeah, there’s not much exposure here at all. I went to BYU track camp last year and I jumped 7-feet there, and that’s when the track coach first talked to me and got my information. 8) In the last two years, we’ve seen at two male Alaskan athletes—distance runner Trevor Dunbar of Kodiak and thrower Jordan Clarke of Bartlett—really emerge from Alaska to make a splash on the national scene. Do you look at those guys and think, That’s where I’d like to get, where I’m not just known as the best jumper in Alaska, but a guy who can compete on the national level? Have you gotten to know either of those guys through competition or proximity? Yeah, I’d like to break through to the national scene, especially in the high jump; that would be really nice. Jordan Clarke is my best friend’s sister’s boyfriend. I followed his career pretty closely, and I have his number and text him sometimes. 9) Can you describe the coaching situation there at Service High? Is there a particular events coach you work with, or is it one single head coach? What’s the set-up like in terms of your guidance in the jumps? Our head coach has changed every year since I’ve been there, but we’ve had the same jumping coach—his name is Coach Chmielewski—pretty much since I was in seventh grade. That consistency has really helped, because he’s the best high jumping coach in Alaska. 10) You’ve got the benefit of dual perspective here, having grown up until seventh grade in Texas, but I’m wondering if you feel like some people have crazy ideas about life in Alaska? When you talk to friends back in Texas, or other people you might be in touch with in the Lower 48, what are some of the most off-the-wall questions or perceptions you’ve gotten about your life up there? Any misconceptions you’d like to lay to rest? Some people seriously think we live in igloos, or have polar bears for pets. One kid asked me if we eat penguins. They just have no idea.